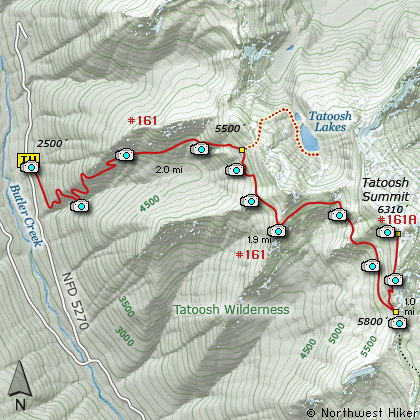 This hike uses the same trail head as the hike to Tatoosh Lakes. You begin the climb off Forest Road 5270, and in the first 2.5 miles you gain almost 3000'. Then the trail breaks out into more open areas and at 3 miles you come to the junction to Tatoosh Lakes. In season you will be treated to outstanding wildflower displays, and in every season you will be treated to incredible vistas. After the junction to Tatoosh Lakes the trail parallels the ridge line for the next 2 miles. Just a few feet before the trail crosses over the saddle of Tatoosh Ridge, Trail #161A to the summit veers off to the left. The trail then switchbacks its way up the ridge line to the top of Tatoosh Ridge. 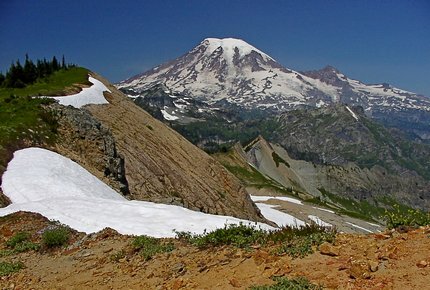 From the summit you are overwhelmed with vistas of Mt Rainier, Mt Adams, Mt St Helens and the nearby Goat Rock Wilderness mountains. Travel east on US Hwy 12 for about 64 miles to Packwood. As you eastbound on US Hwy 12 through Packwood, near the east end of the town, you will come to the junction of Forest Road 52 on your left. Follow FR52 west across the Cowlitz River, and uphill out of the valley for about 4.1 miles. You will then come to the junction with Forest Road 5270 on your right. Bear right and follow FR5270 for about 5.6 miles where it is just about to cross Butter Creek. Bear right onto Forest Road 5272 and follow this road for about 1.4 miles and you will find the trailhead for both Tatoosh Wilderness hikes on your right.